The related companies Utility Mfg. Co.., Spartus, and Herold created a great many inexpensive camera models, sold under a dizzying array of brands, from the 1930s into the 1960s. The Chicago brand Spartus is at the center of this constellation, and this page tries to summarize these companies' history and camera models. 2.1 New York: Utility Mfg. Co. The Utility Manufacturing Company was founded in New York in 1934, and offered several camera lines, including folding cameras and box cameras. 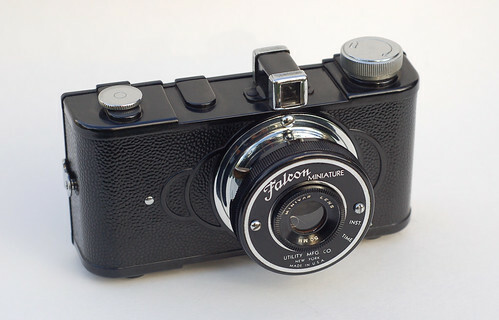 Its main camera brand was Falcon, a name particularly associated with a line of "half frame" 3×4 cm cameras for 127 film—for example, the Falcon Miniature. 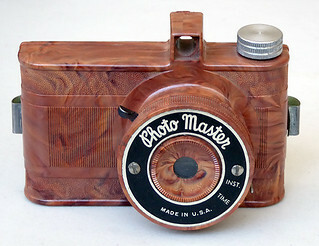 These were molded bakelite cameras in an eye-level style quickly becoming popular in other "minicams" of the day, such as the Argus A. In 1941 Utility was bought by Spartus Corp., and moved west to Chicago, Illinois. Spartus was one of several companies owned by successful Chicago businessman Jack Galter, who also manufactured clocks and razors. The new Spartus address was 711 West Lake Street, Chicago, an address where the Monarck/Monarch company had been producing cameras before WWII. Previous and new camera lines then appeared under the branding Spartus. Many of these models were molded plastic with distinctive styling. Several Spartus models are seen with president Jack Galter's branding "Galter Products Co." In 1951 Spartus' head of sales, Harold Rubin, bought the company and renamed it Herold Mfg. Co. while continuing to brand cameras as Spartus. This company also produced razors and clocks; in fact Spartus clocks outlived cameras as the company's main product. Around 1960 the Herold Mfg. Co. returned to the name Spartus Corporation. New York: Utility Mfg. Co.
Other Herold models that did not use Spartus brand? ↑ An advertisement from May 1940 gives the address of Utility Manufacturing Co., Inc. as 40 West 25th St., New York NY. ↑ 4.0 4.1 Spartus advertisement, Popular Photography magazine, August 1947 (Vol. 21, No. 2) page 12. ↑ Monarck ad in the June 1940 Popular Photography (Vol. 6, No. 6), page 107. ↑ An example is this November 1946 ad from Popular Photography (Vol. 19, No. 5) page 31. The Spartus camera brand certainly was used following WWII, but perhaps earlier. ↑ The Herold Products manual for the Spartus 620 shows an address of 2110 W. Walnut, Chicago. The Spartus address of 715 W. Lake St. is a couple of miles east of this. 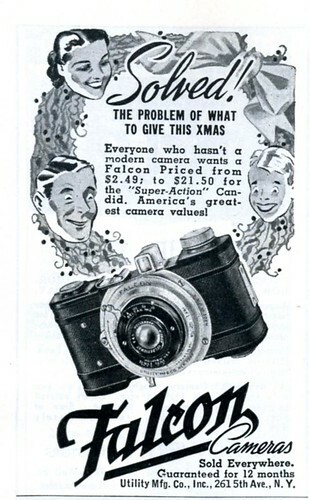 ↑ An advertisement from December 1955 promotes the Spartus Full-Vue camera, a Spartus clock, and an electric razor (Life magazine Dec 12, 1955; Vol. 39, No. 24; page 56). Various Spartus PDF Instruction Manuals from OrphanCameras.com listed alphabetically. This page was last edited on 5 January 2019, at 00:20.